The whatever-it-is has been suspended. It has also been even more extensively pruned; horticulturists in Pretty Lady's social circle will be receiving half-rooted cuttings as stocking-stuffers this year. 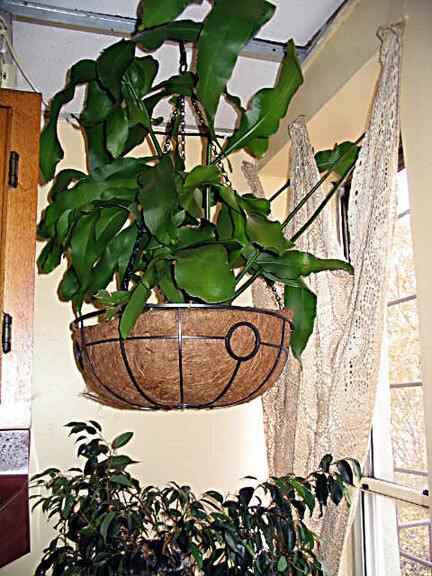 Roots were installed in a mix of half potting soil, half epiphyte bark, and fertilizer has been sharply curtailed. Either the monster plant will burst forth in a riot of frantic enflorescence, or suddenly expire. Pretty Lady confesses that it makes her feel ever so slightly uneasy, having this bizarre life form dangling above her head as she goes about her cooking, but she can now see freely through the window onto the fire escape, where the miniature rose bush has still a few tremulous blossoms. She promises that this current obsession with domestic affairs will cease, shortly, and she will return to esoteric obfuscations as soon as she's back from the co-op. Now that looks much more like it should. I see a nice airy basket lined with coco matting too. They like air. I commend your courage! Epiphytes are not for everyone. Especially indoors. Now, I take full responsibility should any epiphyte disaster occur. It would not be the first time I lost a plant because it outgrew this particular sunny spot in the kitchen; once they get so big, there's just nowhere else for them to go. This plant was always a gigantic experiment. And the cuttings do root splendidly. Since you all here seem to know much more about exotics than I do, I have a plant problem as well that I would appreciate some help with. I have a Tillsandia (actually, it's my husband's, but watering is my responsibility since I'm home with it) that seems to be dying of dehydration. In spite of being spritzed at least ten times a day. It hangs from a wire over the kitchen sink so I see and spray it often. Is there any other way to care for/water it? Would it live if I stuck it, say, half under water? Our air is incredibly dry--between natural dryness and forced air heat, and I'm sure that's what's doing it in. I had a Tillandsia Recurvata (aka Ball Moss) that I set on a desk and never did anything to, including watering. It bloomed. I got it off a live oak tree in my front yard in Austin. So it was basically living in its natural environment, only indoors. I don't know what type if tillansdia yours is, but you may consider not watering it so much, or spritzing *near* it as opposed to *onto* it. Or maybe place a dish of water under it to humidify the immediate environment? Seems like the presence of the sink should do the trick. Anon may have a problem with the chlorination. I had afine granite out back which had lovely moss in season, season being during the summer and winter rains only. I thought to water it so that I had a lovely moss other seasons. Guess what! It turned up its toes & never came back. The chlorination of the household water is the only thing I could think of.